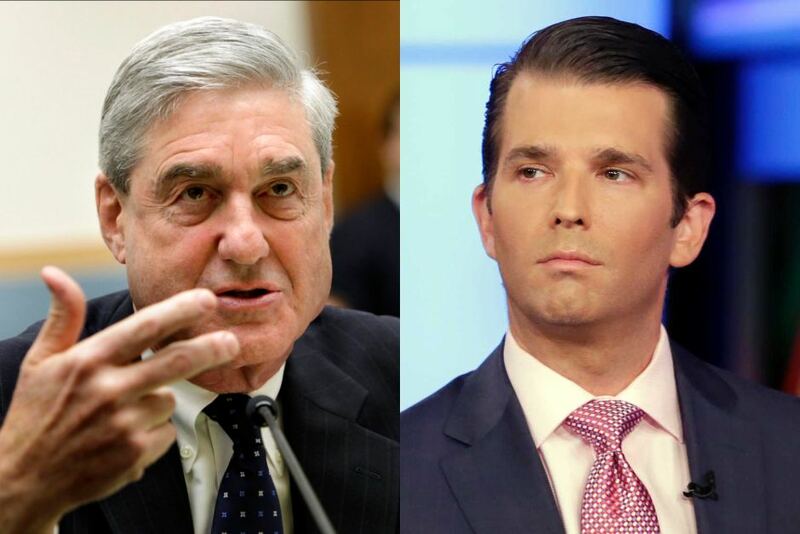 And So It Begins…Media Pushes For Mueller To Indict Donald Trump Jr.
D.C. Whispers warned of it last year and again just days ago. Now, the Establishment Media is confirming those earlier reports. The Mueller investigation appears poised to indict President Trump’s first-born son, Donald Trump Jr.
Trump Jr. told the Senate committee last year that he was “peripherally aware” of these discussions but that he didn’t know that Cohen had sent an email to the Putin aide, Dmitry Peskov. First, it called into question the Trump family’s denials about having business dealings with Russians. Second, it confirmed the Trumps had a channel open with powerful Russians at the same time the Russian government was waging a widespread campaign of “active measures” against the United States. According to Trump Jr. and others who have spoken to Congress, the Trump family was negotiating with Moscow real estate billionaire Aras Agalarov and his family. Aras and his son Emin also were in the chain of contacts used to convey an offer of help for the Trump campaign from the Russian government to Trump Jr., one that yielded a meeting in New York City in June of 2016. Trump Jr. and other top campaign leaders hosted a delegation they believed would deliver dirt on Hillary Clinton. The contrast between Cohen’s statement and Trump Jr’s version of events may complicate potential legal problems for Trump Jr. Although seldom prosecuted, lying to Congress is against the law — as evidenced by Cohen’s plea. If the office of special counsel Robert Mueller is looking for prospective criminal charges to level against Trump Jr. and it has evidence from Cohen or others that he was aware of the Moscow negotiations into 2016, that could prove problematic for Trump Jr.
Trump Jr. was advised in his Senate Judiciary Committee interview that although he hadn’t sworn an oath to tell the truth, he was required by law to answer questions from Congress truthfully. He was asked whether he understood that. “I do,” Trump Jr. answered. To be sure, none of the above media-generated hype proves anything legally against Donald Trump Jr. It is speculation, but very dangerous speculation as it is clearly working hand-in-hand with the Mueller investigation. Mueller goes after Cohen, Cohen then offers up a likely Mueller-constructed plea deal that implicates Donald Trump Jr. Media stories are then built around that implication thus laying the groundwork for Mueller’s next move—an indictment. It doesn’t take much imagination to realize the seismic shock those stunning headlines would generate. Let us hope President Trump is fully prepared to go to war to save his family and squash this attempt quickly because it appears we are now on the brink of that very conflict. Liberal Logic: Beer + Conservative = BAD. Cocaine + Liberal = President. Judge Brett Kavanaugh stated he liked beer as a student and he still likes beer as an adult. Leftwing media and politicians immediately pushed claims of drunken partying, blackouts, etc. in an attempt to paint Kavanaugh as unsuitable for the Supreme Court. Where was the same outrage/concern when Barack Obama admitted he was a big fan of cocaine in college? Ah, there was none. Posted in DC WhispersTagged Beer, Cocaine, Kavanaugh, obama, Trump Jr.